Vizury is an internet marketing and customer relationship management company that develops technology products and platforms to help companies grow their customer base and increase customer loyalty. The company leverages the customer data acquired by the companies to develop personalized strategies and campaigns to drive customer growth. The Vizury products help the users in managing their business growth by enabling them to reach farther client avenues and providing them with the tools to develop personalized marketing campaigns and analyze marketing results. The Vizury products are categorized into three main groups namely Engage Commerce, Engage Finance, and Engage Travel. Under these categories, there are 10 different products that cater to the marketing needs of a wide range of niche industries. Vizury’s first product range is Engage Commerce. The products under this category cover all the aspects of commerce marketing. This includes reaching new clients and attracting them towards the business, retaining the existing clients through various strategies. The products are compatible across different channels, devices, and platforms, and highly customizable to cater to the personal requirements of the businesses. 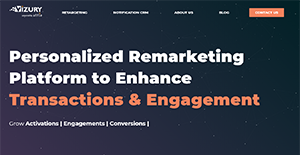 One such product is Browser Push Notifications, which works to re-engage the website visitors through notification even if they have closed the site. Another product is Dynamic Emails, which generated highly personalized emails according to the subscribers’ interests. The Predict Uninstall is yet another Commerce product that predicts the app uninstalls and works through various loyalty campaigns to retain the customers and prevents the valuable customers from uninstalling apps. The second product range called Engage Finance, targets banks and financial companies. As customers of today use different devices and platforms to make transactions, Vizury helps the banks in providing their customers with a personalized experience; thus, helping them in attracting more customers and retaining the existing ones. Engage Travel is the third product range from Vizury, designed to assist travel agencies, airlines, and tour companies in generating greater ROIs. The products under this category work to find the travelers and giving them a personalized experience so that they can be attracted towards buying tickets. These products use fast and efficient marketing strategies to reach interested clients in time and converting them into loyal customers. Every enterprise has its own characteristics, and might call for a specific Demand Generation Software solution that will be designed for their business size, type of customers and staff and even particular industry they cater to. It's not wise to count on getting a perfect services that is going to be suitable for every business no matter what their background is. It may be a good idea to read a few Vizury reviews first and even then you should pay attention to what the solution is intended to do for your business and your workers. Do you need an easy and straightforward service with just elementary features? Will you really use the complex functionalities required by experts and big enterprises? Are there any specific features that are especially useful for the industry you work in? If you ask yourself these questions it is going to be much easier to find a trustworthy solution that will match your budget. How Much Does Vizury Cost? Freemium Model. Contact for more details. We realize that when you make a decision to buy Marketing Software it’s important not only to see how experts evaluate it in their reviews, but also to find out if the real people and companies that buy it are actually satisfied with the product. That’s why we’ve created our behavior-based Customer Satisfaction Algorithm™ that gathers customer reviews, comments and Vizury reviews across a wide range of social media sites. The data is then presented in an easy to digest form showing how many people had positive and negative experience with Vizury. With that information at hand you should be equipped to make an informed buying decision that you won’t regret. What are Vizury pricing details? What integrations are available for Vizury? If you need more information about Vizury or you simply have a question let us know what you need and we’ll forward your request directly to the vendor.